Several significant and far-reaching decisions and changes were made in Linnavuori during 1990’s. In 1986 Valmet had made an agreement of cooperation with Austrian Steyr-Daimler-Puch AG. One of the objectives was to jointly develop a new diesel engine generation and to share the manufacturing between factories in Nokia and in Steyr. Due to finance and technology conflicts the cooperation came to an end and finally Steyr discontinued own engine manufacture, whereas Valmet decided to finalize development and start serial production. 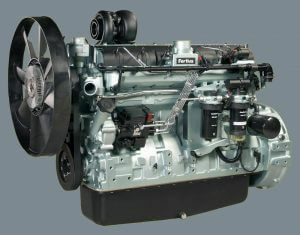 New engine range was introduced in record time and conveniently for new generation Valmet tractor models by end of 1991. Already from the very beginning of development the upcoming emission requirements and noise emission reduction were taken into consideration. It was also apparent that engines were dimensioned for turbocharging and charge air cooling. Steyr Landmaschinentechnik became Valmet engine customer in 1993 when it was developing own large size tractor range. With this Steyr came back to square 1 as drafted in 1986, the user of Valmet engines. By end 1990’s the fluent collaboration brought to market place the first electronically controlled SisuDiesel engine, which was driving the tractor with step less CVT transmission developed by Steyr. Valmet do Brazil was founded in 1960 and local tractor manufacturing started in 1962. At that time, the engine had to be a local make and Valmet chose MWM as its partner. The first delivery of 50 Complete Build Up (CBU) 420 DS engines was made for Valmet 985S models in 1993. 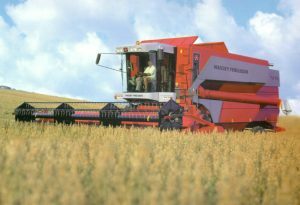 Massey Ferguson had received so much good feedback of 6 cylinder Valmet diesels in its tractors and combines made by Dronningborg, that in 1995 it decided to enlarge the tractor range with Valmet engines up to 200hp range. The highest rated tractor would be with the all new, long stroke 7,4-liter engine, while the smaller continued with 6,6-liter turbo engine. How the robustness of 612 engines could be benefited in future, it was contemplated in Nokia? So it was decided that the most powerful Valmet diesel ever would be created: 6 cylinders, 8,4 liters, potential for over 330hp, even up to 400hp in combine harvesters. Engine was introduced to public in Agritechnica exhibition in Hannover, Germany, November 1995. That same year Valmet diesel had a 13% market share in combines in Europe, main customers Dronningborg Industries and Sampo-Rosenlew. In early 1990’s it was pondered if an engine manufacturer with only 12.000 engine annual production volume can survive in the market place, when competitors in same power category are making more than 100.000 engines. Experience over the many years in the industry had proven that same engine properties do not work properly both on highway in truck and in the field in tractor, or in forest machine ion forest. In addition, the upcoming emission requirements for on-road vehicles would be different to those for off-road machinery. It was also understood that resources would not be sufficient for development of both. There were also strong doubts, if enough customers would be found for profitable operation. Conclusion was that factory will specialize in engines for off-road applications. This definition of policy lifted the engine position separate from mass products and company started clearly to focus in customer oriented application development. Flexibility was adjusted to meet customer demands with principle: “tell us what kind of engine you need and we will make it for you”. Engine was also personalized with name of the assembler on the decal on side of engine. When coming to 1990’s, Valmet Works in Linnavuori had several product lines, while diesel engines was the largest. Factory became the leading designer and manufacturer of special machine tools and flexible manufacturing systems (FMS) in the Nordic countries. As heritage of the original business plan was the operations under the ground of mountain for assembly and maintenance of jet engines of the Finnish Air Force. Along with engines the manufacture of power generating sets had been developing since 1950’s. When the structural changes were begun within Valmet Corporation in early 1990’s, three separate units were formed in Linnavuori: Valmet Diesel including gears and power generation, Valmet Factory Automation and Valmet Aviation. After the operation in ownership between Valmet Co. and Sisu were made in 1994, Valmet Diesel and Factory Automation became part of new Sisu and Aviation moved to Patria Finavitec. Since the business idea of Sisu was based in vehicles and machinery moving on rubber wheels, Automation was sold to Mercantile Co. at the end of 1995. Valmet Diesel was renamed to SisuDiesel and a little later also engine brand name was changed to SisuDiesel. 1994 was first year in company history to exceed 10.000 in annual production volume. SisuDiesel became the largest gear wheel manufacturer in the Nordic countries, besides own engine manufacture, the tractor plants the biggest customer. More foot hold brought the agreement with Canadian Bombardier Corp. for delivering Syncro transmissions to the snow scooter plants. Snow scooters have been an obvious “hobby” for Linnavuori factory, it did in fact develop an all-terrain band vehicle already in early 1970’s. Sampo-Rosenlew was also a customer for complete transmissions. Deliveries to other manufacturing units with Sisu Corp. increased rapidly in mid 1990’s. Sisu Logging, today known as Komatsu Forest, leading developer and manufacturer of forest machinery with roots in Valmet tractors, uses own SisuDiesel engines. The experience from Sisu Terminal Systems’ users proved that with own engines the material handling equipment had longer life than with competing engine brands. Ownership changed again in 1997, when Partek acquired the majority of Sisu Corp. shares from government. This change brought considerable increase in resources for engine development and production. Engine deliveries started also to Partek Forest manufacturing units in Wisconsin, USA, and also to Canada.